So we are back to reveal our Nifty Thrifty Transformations! But first, did you see the Before Post? No? Well, click here! It is such a thrill to do these kinds of DIY Projects and see the transformations happen before your eyes. Very rewarding! We had so much fun & we can’t wait to get our hands dirty for more DIY Projects. So are you ready? Here goes! Here is the fabulous Side Table I picked up for $5… I primed it then coated it with Bahama Breeze (Krylon) Spray Paint. Next, I gave it some character by “antiquing” (painting) the edges with Décor Art’s Dazzling Metallic’s Champagne Gold. 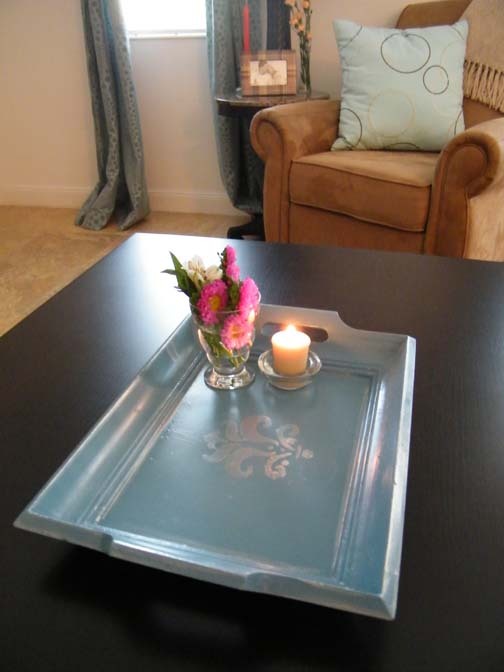 I also used the same technique for the candle holders ($3) & the tray ($3) and they turned out quite nice!! 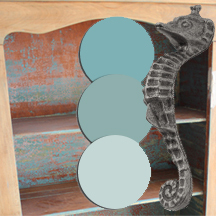 The shelf that has been awaiting a coat of paint also got sprayed this shade… the fresh hue enhances our guest room décor! 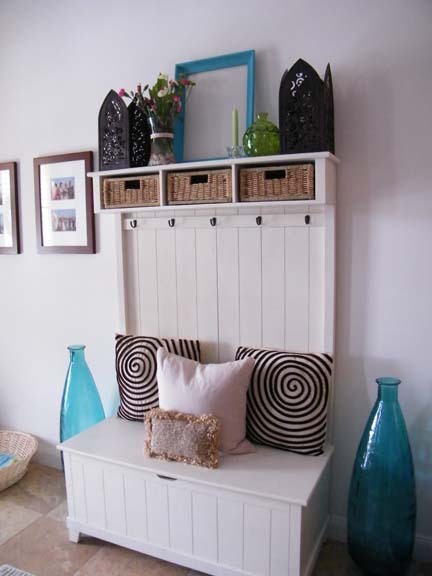 Like I mentioned in the first post, we don’t have a mantel… so from time to time I dress this piece of furniture! The frame I picked up for ($1) got a fun coat of Calypso Sky (from FolkArt)… I really wanted a bright pop of color to accent the green accessories already in place! Open frames are a great way to add dimension to a mantel or wall… you could just lean one against the mantel or hang a few by staggering the heights of various sizes. 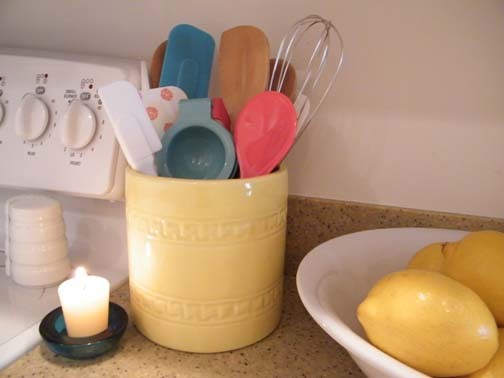 The yellow vase made it into the kitchen to keep our cooking utensils in (well some anyway)… I think it is cute for a splash of sunshine! 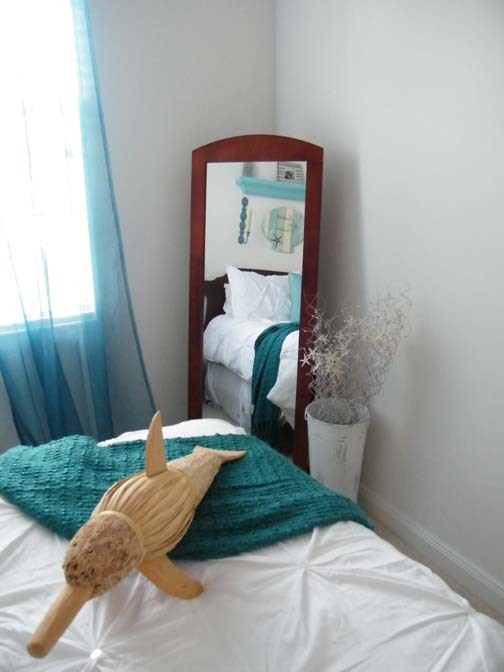 Mr. Dolphin found a home in our Guest Room..
Isn’t it awesome what a little can of spray paint can do? We designed a new story for these fun items… can you? Bring new life to your old stuff! You can give a face-lift to almost any item using spray paint. I am a huge fan of spray paint because it is cheap, easy to use, and the results are beautiful. Spray paint comes in every color and multiple finishes. I prefer a satin finish for most home décor projects, but flat and high gloss options are also available. My favorite spray paint is Krylon’s indoor/outdoor paint. It adheres smoothly to surfaces, dries in less than ten minutes, and costs less than $3 per can at Wal-Mart. 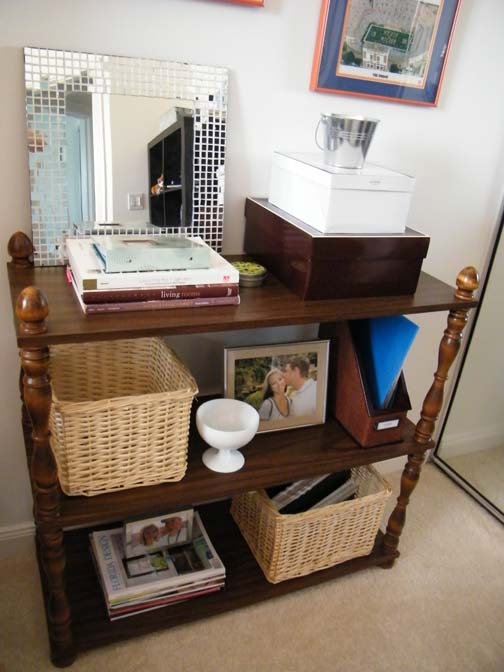 Wooden items, such as picture frames, shelves, furniture, and mirrors can be made new with a fresh coat of paint. 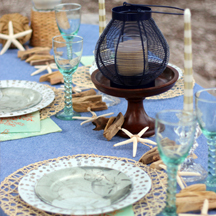 As you can see, I have done this with several of these items and am thrilled with the results. 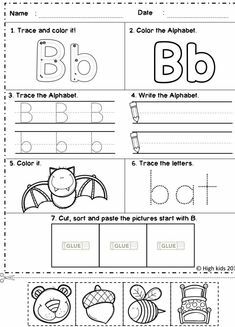 Need a little help before beginning? For picture frames and mirrors, remove the glass from the frame before starting your project. Start by sanding the wood just a little with a piece of fine sand paper. Sand the entire surface using light, gentle strokes. Roughening the wood up just a little will help the paint stick to the surface (I had to do that with the shelf). Don’t damage the wood by going crazy with the sand paper. There’s no need to completely remove the old paint or finish. After sanding, wipe the wood down thoroughly with a damp rag to remove any dust left from sanding. Now you’re ready to paint. It’s best to do the painting outside in the sun if at all possible. Spray paint looks best if multiple light coats are applied. Follow the directions on the can for application. Spraying the paint on too thick will lead to drips, which will have to be sanded down and repainted later. 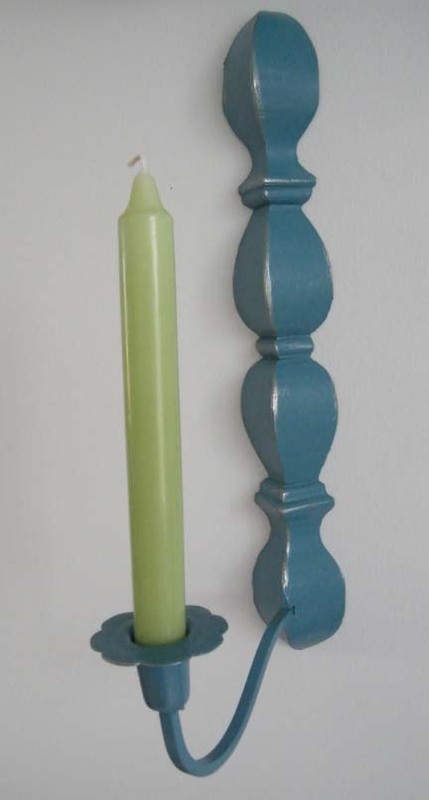 Two or three light coats of paint should be enough to achieve a smooth even finish. After the final coat dries, the project is complete. Unlike painting with a brush, there’s relatively no clean up when using spray paint. Add a fun twist to a child’s play room or a laundry room using chalkboard or magnet paint (usually the paint comes in black or dark green). Patio Furniture… Use indoor/outdoor spray paint for metal or wood furniture. If your outdoor furniture is plastic, select a special spray paint made specifically to adhere to plastic such as Krylon’s Fusion for Plastic. A simple paint job can make your outdoor living space look brand new! Kitchen appliances, barbecues, doors, shutters, cabinets, hardware, glass, radiators, and farm equipment can all be recreated using specially designed types of spray paint. Lamps, light fixtures & ceiling fans… Turn an old brass fixture into a brushed metal work of art. To start, take the fixture apart, removing any glass, light bulbs, fan blades, or electrical cords. If some of these parts are not removable, cover them with painter’s tape. I prefer brushed metallic paint for metal light fixtures and fans. The look of brushed nickel adds style to any home. 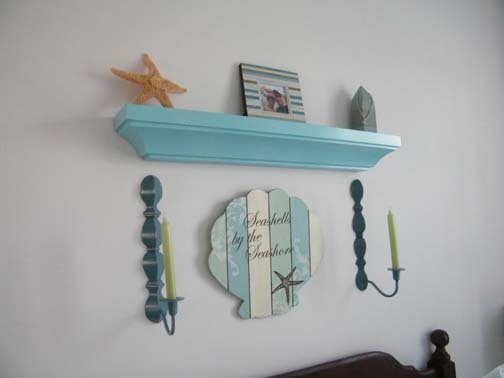 Metal items do not need to be sanded prior to painting. Follow the steps outlined above for applying the spray paint. Make sure to read the instructions on the can as well. When the paint is dry, reassemble the fixture and fall in love with its new updated look. So… Spray painting really can save you money by transforming something you already have (or purchased). It’s a way of recycling, so in a sense it is “Green”, plus you can recycle the spray paint can when you’re done to make this project even more earth friendly. Spray paint costs $1-$6 per can, so it’s a relatively inexpensive project. 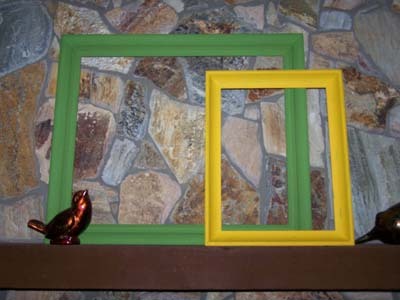 Smaller projects like picture frames and mirror frames will require far less than one can. Spray paint can be purchased at any home improvement store or craft store. 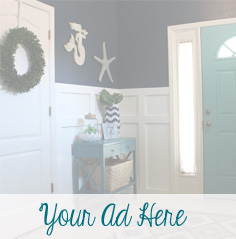 So this week, I challenge you to find something tucked away in the back of a closet somewhere that you can turn into a stylish piece of décor for your home. 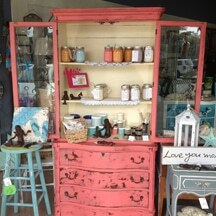 Or like us, visit your local thrift stores and have yourself a little DIY Project day in the sun! 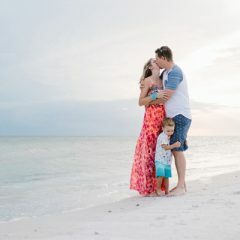 You’ll have fun doing the project, you’ll be amazed at the transformation, and you’ll love how easy and inexpensive spray painting projects can be. 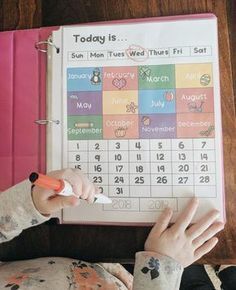 So, have any projects on the schedule? Do tell & show us your results! We want to see!! 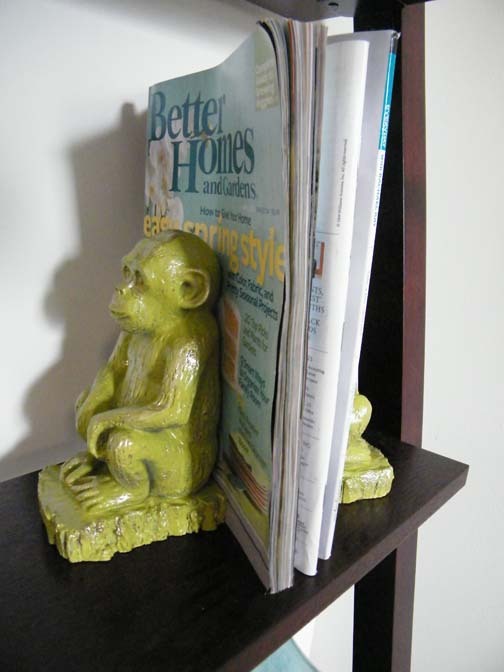 Oh, Also visit this blog for other fun DIY Projects! Oh and here at this party too! Love the Bahama Breeze! Your pops of color are beautiful and cheerful! Love it! Thank you Missy! I had such a good time painting everything!! 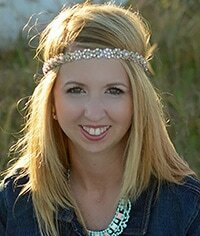 HI, Lindsay, I love your thrifty finds! 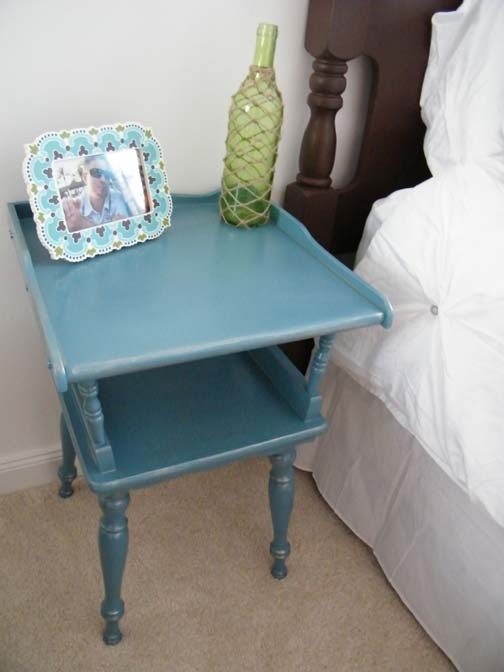 I too have used Bahama Breeze on a side table in my guestroom & it’s a great color. I love your revamps, they look great in your home. I’m trying to get everyone who joins my Monday parties to PLEASE link back to my party post from YOUR post, pretty please! That way, your readers can come over to the party too. Hi! Love the little pops of color all over your house! I just bought the same kissing pleat bedding from Target! Looks great with the throw over it. LOVE IT! You bought the bedding too? Isn’t is perfectly adorable? So fun! I had my mom buy the same style in aqua just the other day! Enjoy! 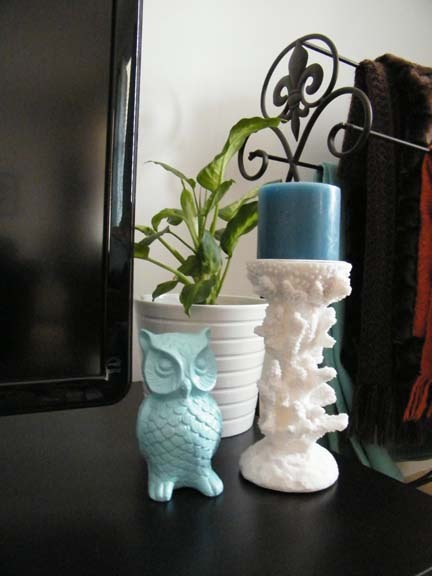 Luv that $5 table and that .25 cent OWL is just too stinkin cute! Hi Linda, thanks for following A Design Story! Thank you for the sweet words! It is so cool!!!!!!!!!!!! Thank you for sharing!!! I love all of the color pops. What a way to brighten up a room! Everything looks fabulous! Thanks for sharing at Fun to Craft’s Spring has Sprung Party!